-Messenger photo by Hans Madsen Degan Klindt, 14, an eight-grader at the Fort Dodge Middle School, works on solving Rubik’s Cube Thursday afternoon during their last day of school talent show. Klindt finished it in less than three minutes, his on stage goal. -Messenger photo by Hans Madsen Grace Casciato, 13, a seventh-grader at Fort Dodge Middle School, sings and plays piano Thursday morning during a last day of school talent show. 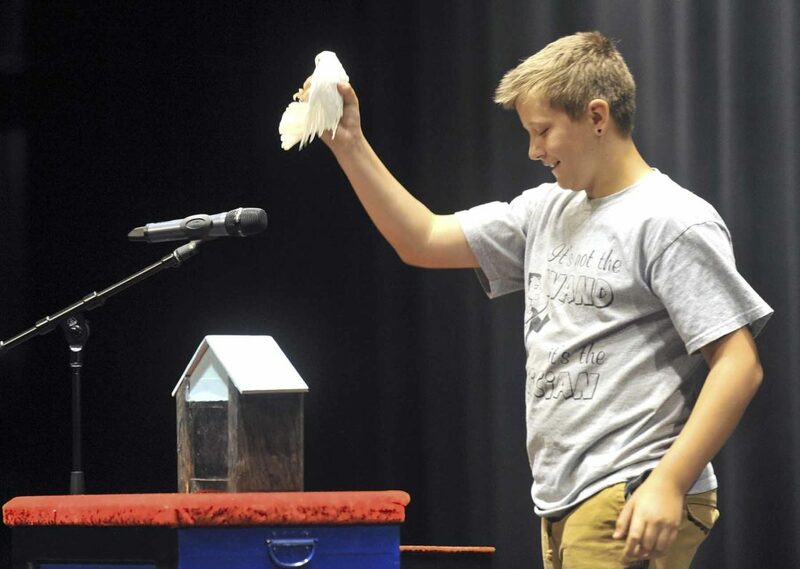 -Messenger photo by Hans Madsen Connor Thoma, 13, a seventh-grader at Fort Dodge Middle School, made a dove appear in the small house on the table Thursday morning during a last day of school talent show. There’s some very talented students attending the Fort Dodge Middle School. Some of them sing, some of them play instruments, some of them do magic tricks and few tell jokes. One of them can solve the Rubik’s Cube in no time. Degan Klindt, 14, an eighth-grader at the school, demonstrated that during an end-of-the-year talent show Thursday. 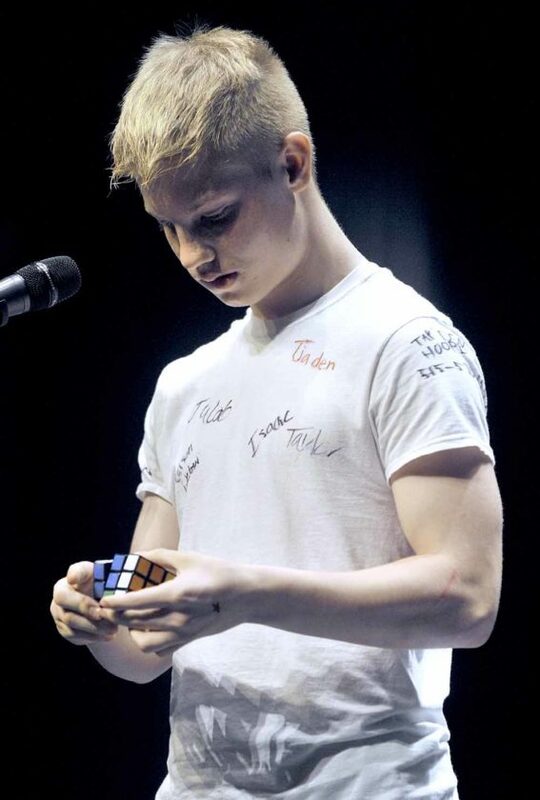 With a randomly arranged cube handed to him by another student, Klindt’s hands were a blur as he worked to restore the cube to its original state. That 100 times? That’s not just solving the puzzle. That’s solving the puzzle in less than three minutes, which was his on-stage challenge Thursday. “My personal best is one minute 20 seconds,” he said. While his middle school days might be over now, he plans on continuing to better his time and work with other puzzles. “Just keep solving,” he said. Connor Thoma’s act was for the birds — he made several doves appear and disappear during his magic act. His introduction to magic was actually recorded for prosperity. He attended an introduction to magic open lesson with Fort Dodge magician Larry Dunbar and was featured in The Messenger story about that event. He was 3 1/2 at the time, he said. While he’s no stranger to the stage, he is a stranger to stage fright. “I do it a lot,” he said. He’s going to be making things disappear and appear, as well as getting cut up ropes to join back into one section during the course of his summer vacation. “I’m doing 31 magic shows in just two months,” he said. 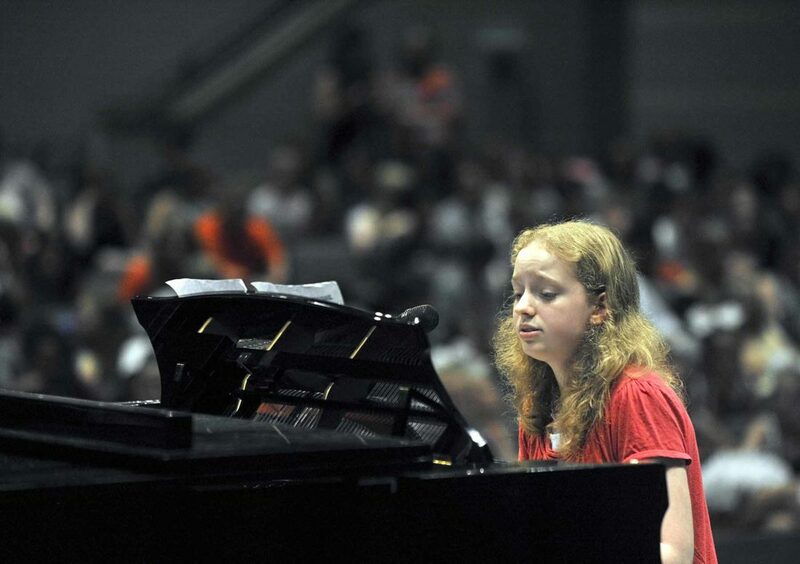 Grace Casciato, 12, a seventh-grader, filled the school auditorium with her voice and piano music Thursday. “I started piano when I was really little, kindergarten or first grade,” she said. A family move put a temporary halt to the piano lessons for a few years, but she’s kept up with her playing and singing. She found it easy to play in front of hundreds of her classmates.